At Smokey House Center we're still reeling from the good energy and great work that Orvis retail managers shared with us in September. The day of service was well documented locally in the Bennington Banner. We also posted many of our photos from the day's activities online here. Over 80 retail managers from around the country were gathered in the area for annual meetings and trainings and arranged to spend an entire afternoon with us in Danby. Volunteers, scraped and painted barns, harvested squash, turnips, and onions on the Community Farm, cleared a new trail around the pond, tightened greenhouse film, mulched blueberries, and more. Smokey House Center in Danby, Vermont seeks two Community Farm Interns for the 2018 growing season. Interns will live on site and assist with all aspects of vegetable and other farm production in a manner that integrates education partners, visiting groups, and volunteers. We’re looking for dedicated, community-minded farm interns who want to hone their growing skills in a public-facing, educational farm setting. Under the supervision of the Smokey House Farmer and Education Coordinator, the Community Farm Intern will assist with the day-to-day operations of the Community Farm, educational gardens, blueberries, Christmas trees, and grounds. Leading some weekly public volunteer sessions. The Smokey House Center Community Farm is pursuing Organic certification in 2018. We use hand tools and some limited mechanical cultivation. Some farming and cultivation experience is helpful, though it is not required. Capacity for physical work 6-8 hours a day, comfort working in all weather conditions, ability to bend and lift. Must have a positive attitude and interest in work with folks of all ages. This is a growing community space and we are looking for interns who are excited about engaging with visitors and volunteers. An ideal candidate will be able to stay on through the fall, which is when the bulk of our harvest, distribution, and programming happen. We will entertain applications for summer interns. Start date negotiable. Educational and mentorship opportunities in a beautiful location. For over forty years, Smokey House Center has used our incredible 5,000-acre land resource as a stunning backdrop for youth development and education. Smokey House Center’s fundamental purpose is to maintain a working landscape that promotes sustainable agricultural and forestry practices while engaging people in meaningful ways. The Smokey House Community Farm project grows food with local youth, visitors, and volunteers for donation to food security and other community food programs. Smokey House Center welcomes a new crew of Youth Leaders to our team for the summer. 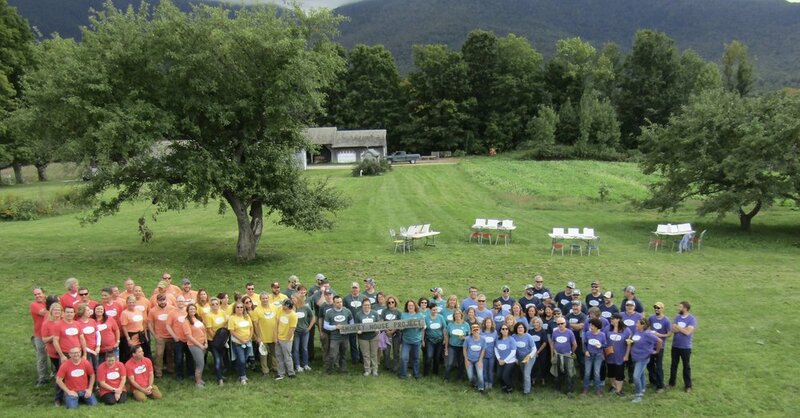 In a region where youth employment opportunities are few, we're offering positions that hone leadership, outdoor, and workplace skills in support of our Community Farm and Danby Mountain Day Camp programs. This week, our anchor team of teenagers is working hard on the Community Farm while preparing space and program for the arrival of our first summer day campers on July 10. Additional youth leaders will join us throughout the season, and we'll profile them here. Thanks, Thomas, Thann, and Charlotte (pictured here with Camp Director Mel) for all of your good work already. This summer is off to a great start! Youth Works crew with Farm Educator Jamie (r). We developed the Community Farm project to increase both public engagement at Smokey House Center and opportunities for new partnerships. Now in our second year, we're happy to work with so many groups eager to support youth leadership and development through farm and food systems work. We've got land resources and work galore, and we work with a wide range of skilled individuals and organizations to use those resources to meet our mutual missions in education, conservation, and agriculture. Youthworks youth mission trips brining young people from around the country to the greater Rutland area for a week of service and community connection. And throughout the season we also host weekly public volunteer sessions, occasional workshops, school groups, other camps, visiting college students, coordinated gleaners, and others. If you or your group would like to help us grow food with and for the community, please be in touch. Smokey House Center is pleased to welcome Melanie Virgilio as our inaugural summer day camp director. Mel is an educator from Sunderland, VT with a long record of classroom and community support for area youth. She has been a substitute teacher in the local school system, and recently completed her teaching degree with a placement at Burr and Burton Academy. Mel is a long-serving member of the Sunderland Elementary and BRSU school boards, and was recently elected to the Taconic and Green Mountains Regional District board. In addition to her many professional arts and marketing roles, Mel has been an arts educator with Vermont Arts Exchange in North Bennington, where she also recently supported all the administrative functions of a successful summer day camp program. Mel inspires children and young adults through arts education, environmental awareness, and community engagement. She's eager to dig in on the Smokey House farm and explore the nearby forests with local kids this summer. Register for Danby Mountain Day Camp online here. Danby Mountain Day Camp at Smokey House starts June 26th. Register below or download and print a copy of this registration form. Hunger Free Vermont quarterly convenes the Hunger Council of Rutland County -- among many such Councils throughout the state. These Councils "bring together community leaders to create local solutions to end hunger." We were fortunate to join this coalition of thoughtful leaders in Rutland this month for a meeting focused on local food production and agriculture's connection to anti-hunger work in our area. The Hunger Council reveals a robust network of organizations and individuals working hard to meet very real needs in our community (1 in 4 children in Rutland County are food insecure, according to Hunger Free Vermont's webpage). Our Community Farm project relies on the commitment of this network, and provides a unique opportunity for community connections in our farm fields. Join us this season!